“Mezze” means “to taste” or “snack” and is a tradition that makes up a large part of dining in Middle Eastern cultures. 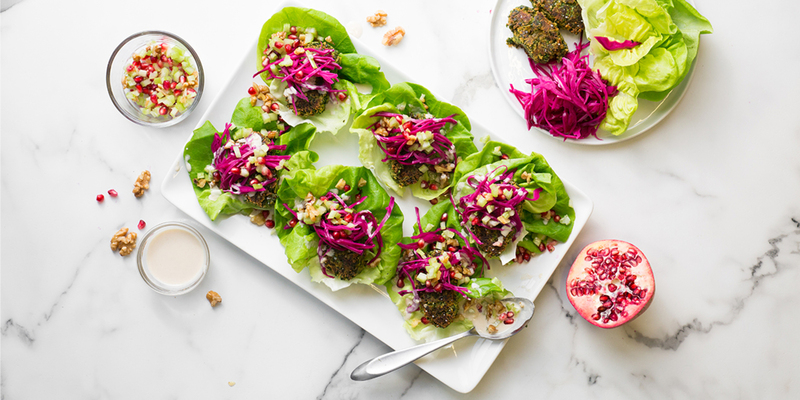 We make our falafel with bright green, vitamin rich kale and serve it alongside a crunchy celery pomegranate relish. Be sure to work in batches if you have a smaller food processor. Don’t be afraid to open it up and scrape down the sides as needed. Place red cabbage in a medium bowl. In a small saucepan, combine sugar, vinegar, and ¾ cups water and bring to boil over high heat. Carefully pour the pickling liquid over the cabbage and move to the refrigerator to cool. Rinse, dry, and destem the kale. Roughly chop. Rinse and dry the lemon. Zest and halve the lemon. Drain the garbanzo beans and rinse. Pat dry. Peel and halve the shallot. Peel 3 garlic cloves. To a food processor, add the garlic cloves, kale, and garbanzos and pulse to roughly chop. Add the cumin and lemon zest. Add the juice from half the lemon. Blend the falafel mixture until well combined and finely chopped. Transfer to a large bowl. Stir in garbanzo flour, hemp seeds, and a pinch of salt and pepper. Place falafel mixture in the refrigerator until Step 5. Peel and mince 1 garlic clove and add to a medium bowl. Whisk in tahini, 2 tbsp water, and 1 tbsp of lemon juice from the remaining half. Season with salt and set aside. Separate the bibb lettuce leaves. Rinse and dry. Rinse and dry the celery. Finely chop and transfer to a small bowl. To the same bowl add the pomegranate seeds, walnuts, 1 tsp of olive oil and a pinch of salt. Stir the celery pomegranate relish to combine. Place a large nonstick skillet over medium-high heat and add 2 tbsp of vegetable oil. Form falafel mixture into 8 patties, about 2 inches in length. Cook falafel patties in batches, until browned, about 3 to 4 minutes per side. If your skillet isn’t big enough, be sure to cook in batches so that you don’t crowd the pan. Transfer falafel patties to paper towels and sprinkle with salt. To build your mezze, divide bibb lettuce leaves between your plates. Top each with a falafel patty, pickled cabbage, and a dollop of the celery pomegranate relish. Drizzle with tahini sauce.